which is now almost impossible to hear on record. It's a truly wonderful instrument with a deep, rich and resonant sound. No wonder Bach had one custom-built to his own specifications. 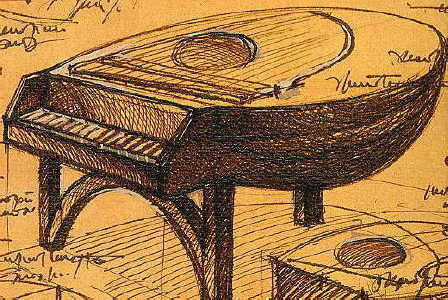 Over a period of some three centuries there are plenty of references to gut-stringed instruments that resemble the harpsichord and imitate the delicate soft timbre of the lute (including its lower-sounding variants, the theorbo and chitarrone or archlute) or the harp, but little concrete information. Not a single such instrument has survived, nor is any contemporary depiction known apart from a rough engraving of the early 16th century. Fewer than ten lute-harpsichord makers are known, and there are reasonably detailed descriptions of instruments made by only two or three of them. Nonetheless, the instrument is mentioned fairly frequently in music books of the early 17th to the mid-18th century. Much of the available information relates to three 18th century German instrument makers: Johann Christoph Fleischer of Hamburg, Johann Nicolaus Bach and the organ builder Zacharias Hildebrandt. Fleishcer built two types of instrument. The smaller had two 8-foot gut-stringed stops with a compass of about three octaves; in the lower two octaves these could be coupled with a 4-foot stop, by analogy with the pairs of octave-tuned bass strings (courses) on the lute. Below the soundboard of the instrument an oval resonator in the shape of a shell, resembling the body of a lute was attached. 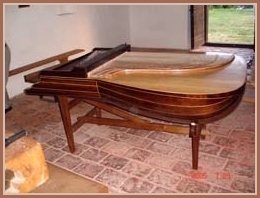 Fleischer called his larger instrument the "Theorbenflugel" (theorbo-harpsichord). Its two gut-stringed stops together made up a double-tuned, 16-foot stop, with the pairs in the lower octave-and-a-half tuned an octave apart, and in the upper range in unison. In addition there was a 4-foot metal-stringed stop, and the combination of the 4-foot and the 16-foot stops produced a "delicate and bell-like" tone. 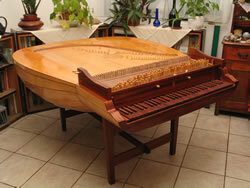 This larger instrument was in the shape of a regular concert harpsichord. Johann Nicolaus Bach (a second cousin of Johann Sebastian) was a composer, organist and instrument maker in Jena. He too built several types of lute-harpsichord. The basic type closely resembled a small wing-shaped, one-manual harpsichord of the usual kind. It only had a single (gut-stringed) stop, but this sounded a pair of strings tuned an octave apart in the lower third of the compass and in unison in the middle third, to approximate as far as possible the impression given by a lute. The instrument had no metal strings at all. According to contemporary accounts, even this simplest of versions made a sound that could deceive a professional lutenist, a fact considered almost miraculous at the time. But a basic shortcoming was the absence of dynamic expression, and to remedy matters J. N. Bach also made instruments with two and three manuals, whose keys sounded the same strings but with different quills and at different points of the string, so providing two or three grades of dynamic and timbre. J. N. Bach also built theorbo-harpsichords with a compass extending down an extra octave. The inventory of Bach's possessions at the time of his death reveals that he owned two such instruments, as well as three harpsichords, one lute and a spinet. Of the few attempts to reconstruct and record a lute-harpsichord, one of the more successful is the instrument built by the Hungarian player Gergely Sárközy, an initial sketch of which appears as the heading to this page. His beautiful instrument gives a truly wonderful sound, very rich and sonorous but with a soft attack. 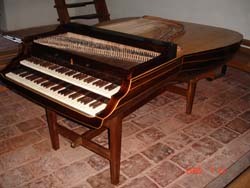 The Baroque Music Club has produced a recording entitled Bach's Domestic Keyboard Instruments, BACH 740 in which some important though lesser-known Bach keyboard and lute works are performed on harpsichord, pedal-harpsichord, clavichord, lute, and lute-harpsichord by Gunnar Johansen, Michael Thomas and Gergely Sárközy. The accompanying note explains the technical differences in construction of the different instruments. Gergely Sárközy's lutes were built for him by Hungarian instrument maker Tihamer Romanek whose father, Andras, was the very first to make lutes in Hungary. The craftmanship of lutherie enchanted Tihamer, who following his graduation as an instrument maker, decided to explore the construction of a lute-harpsichord. Among other instruments, he now offers two models of lute-harpsichord from his own workshops. The lautenwerck or lute-harpsichord differs from the harpsichord in several important respects. 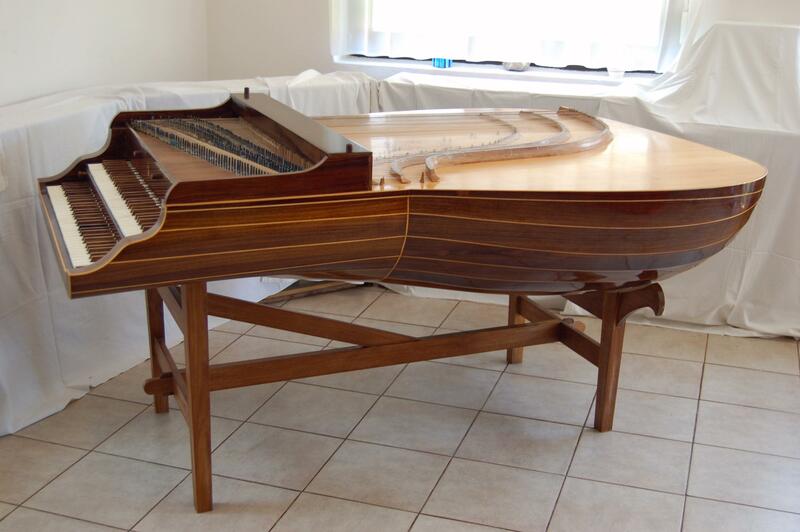 While historical references indicate differing approaches to design, there is general agreement that whereas harpsichords are designed to be strung in metal, the use of gut strings is of primary importance in a lute-harpsichord. However simple replacement of metal strings with gut will not give satisfactory results. Generally, a gut string requires a longer scale (or length at a given pitch) than a metal string, which in turn infers a larger instrument. Pitch for a given string length however, is a function, not only of length, but also of string material and tension. The lower pitched strings of the lute-harpsichord are thicker and under less tension - a technique known as "foreshortening". Thus lautenwercke are often smaller than their metal-strung relatives. Extreme foreshortening of the scale in comparison to the harpsichord, reduces the tension a lautenwerck must bear. Lighter construction is made possible, enabling a lautenwerck to better respond to the less energetic gut string. This is especially true of the soundboard, which can be half the thickness normally found in harpsichords. Gut stringing has other implications for lautenwerck design. As gut strings have more internal friction than their metal counterparts, they generally have less sustain. This allows one to dispense with dampers to a large degree. Individual instruments will dictate where dampers are needed (and how effective they need be), but one rarely finds lautenwercke fitted with dampers on every string. Any resulting "over-ring" is likely to enhance the lute-like effect. The lautenwerck also demands special attention concerning string layout. Thick gut strings vibrate more vigorously than thin metal ones at higher tension. This requires that more space be given between adjacent strings to avoid interference. This consideration encourages the builder to keep his design simple. Two choirs of gut strings seems to be the practical maximum, though a third choir strung in brass is sometimes found. 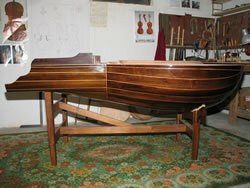 Harpsichords normally have one dedicated jack per string. Lautenwercke often have more than one jack independently serving the same string. Tonal variation is achieved by plucking the string at different points along its length. Dynamic and color variation can also be pursued by using plectra having different properties. This sort of elaboration is most often reserved for instruments having more than one manual. Adding more strings to achieve tonal interest is avoided, and resonate construction maintained. Historical references indicate that in some lautenwercke the internal volume of the instrument was determined by a dome-like structure shaped much like the back of a lute, and indeed modern instruments have been made in which a "lute shell" defines the exterior shape of the instrument. Internal structures placed below the soundboard are also found. Other references however, make no mention of this feature and indicate the construction normally associated with keyboard instruments. for a complete listing of all our Baroque Music pages. Baroque Music Performance: "Authentic" versus "Traditional"
Free MP3 downloads, major baroque composers, and Bach of course. Friend and colleague of JS Bach, famed for his celebrated "silver sounds".